Drager PAS filters deliver clean air which exceeds the specifications of DIN EN 12021, from existing high-pressure networks. Therefore there is no need for a separate air breathing line whilst you work. The Drager PAS filters can be easily mounted on a wall or flat surface. The bottom connections of the wall mounted version allow the users to move around the device without knocking the hoses. The portable version however is connected through the side of the device. The portable versions are also designed with three legs to stand on which not only stop the device from picking up dirt from the floor, but also helps it grip onto the floor, which is helpful when using the device on uneven surfaces. An easy to use filter key makes it a simple task when adjusting the air pressure from the line. 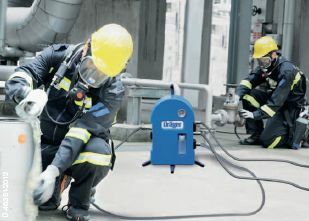 This enables the user to connect compressed air breathing apparatus according to DIN EN 14594 for positive pressure and normal pressure masks. The pressure is then displayed on the manometer and is easily viewable.